In two decades, Amazon has erupted into one of the most successful juggernauts in history, pushing forward absent any apparent limits to its horizons, including this week into high-end computer chips. But its pathway has become decidedly more bruising, straddled by a groundswell of public recriminations in both the U.S. and Europe. Axios' Erica Pandey writes: While it marches from industry to industry, Amazon has become a larger target with more dangerous enemies. "Any regulator that doesn't have one eye on Amazon is not doing their job," says Tim Wu, author of "The Curse of Bigness." The big picture: In Amazon's biggest couple of years yet, it briefly surpassed $1 trillion in value, only the second company ever to do so. It barreled into groceries, pharma and package delivery. It pulled off one of the most successful public relations campaigns ever, capturing more than a year of rapt global attention for what amounted to a mere search for added office space. And yesterday, it unveiled a new chip for the application of artificial intelligence. One of Amazon's biggest plays of all is the cloud, in which it was an early mover, giving it a formidable position alongside Microsoft and IBM. In a note to clients after Amazon's announcement yesterday, Jefferies analyst Brent Thill said its cloud business could more than double in value by 2022, to $350 billion, from about $130 billion today. Amazon's entire current market cap is $818 billion. But all this high-profile activity has come at a cost, including calls for Amazon's breakup. Critics say that while it has offered cheap goods quickly delivered, it has also steamrollered business after business, and contributed to the national epidemic of relatively low, flat wages. In an announcement today, Germany's Federal Cartel Office opened an anti-trust investigation into Amazon, reports Hasan Chowdhury of the Daily Telegraph. In September, the EU launched an inquiry into Amazon's practices. As we've reported before, analysts speculated that Amazon's decision to place a massive new office complex in the D.C. area was in part driven by a strategy to ward off anti-trust activism. In September, Mark May, a retail analyst with Citi, said Amazon should consider preemptively splitting its retail and cloud businesses to steer clear of any regulatory threat. But, but, but: Thill, the Jefferies analyst, tells Axios that he does not perceive any real danger of a forced breakup. And Amazon Web Services CEO Andy Jassy told CNBC that AWS has no plans to spin out the business. GMB protest in the U.K. on Black Friday. Photo: GMB. As Amazon sets the standard for fast and free consumer shipping in the U.S. and Europe, it also confronts a new challenge — employees who are rising up against what they say are unfair working conditions. Erica writes: On Black Friday and Cyber Monday, GMB, a union in the U.K., organized protests against Amazon's 24 warehouses in the country for dangerous working conditions as supervisors demand faster and faster work. Their slogan was "we are not robots." And Amazon workers in three other European countries — Italy, Germany and Spain — walked out as well. The labor unrest is in the U.S., too: In Minnesota, Somalian-born workers at an Amazon warehouse have entered negotiations with the company after protests of their working conditions, reports the NYT's Karen Weise. 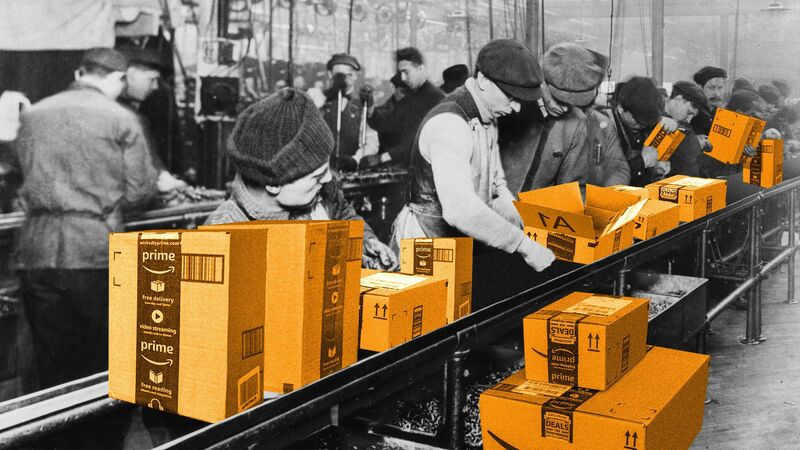 “Amazon has ended up becoming a flash point and a symbol for inequality in modern society,” says Beth Gutelius of the Great Cities Institute at the University of Chicago. Over the last three years, says Michael Rix, a GMB adviser, ambulances were called about 600 times to Amazon warehouses. The incidents ranged from breathing problems to miscarriages. "The expectations that are trickling down to the warehouse floor are really being borne by the workers themselves," Gutelius tells Axios. In the U.S., a Whole Foods worker who did not want to be identified told Axios that organizing efforts have picked up since Amazon's announcement two weeks ago that it will build giant new office complexes in New York and northern Virginia. "I've personally seen, in just the last month, a lot of Amazon organizing groups popping up, and we're all trying to coordinate," the worker said. In a statement, an Amazon spokesperson said, "The safety and well-being of our employees is our number-one priority. Amazon has operations around the world and we deeply value our connection to the communities where we are located. Each community is a little different and in each one, we work to ensure our employees have a great experience with the most important element being our direct connection to our employees." Axios' Kaveh Waddell reports: Two events in the D.C. area this week — one hosted by the Pentagon and the other by the intelligence community — drew hundreds of private sector participants.